The Major is back, offering up his millions to anyone that is brave enough to suffer through his boot camp routine. Click here to play! 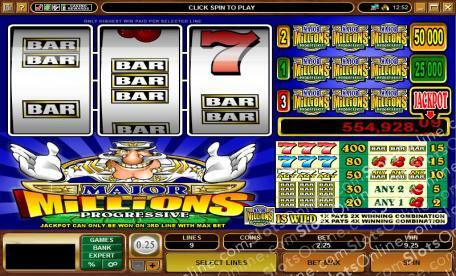 Spin these reels and see if you're tough enough to grab the Major's Millions. In this classic, three reel game, you'll be looking to capture the Major's Millions logo across any of the three pay lines. Spin three of them across pay line one and you'll bring in up to 25000 coins. Grab three across pay line two and get 50000 coins. Finally, three across line three will get you the progressive jackpot! It will also act as a wild symbol and substitute for all others to help you bring in even more wins. It's truly the symbol to look out for in this game. There are a few other symbols to help you through the Major's camp, including lucky sevens, triple, double and single BARS, and cherries. Be sure to bet the max amount of three coins in order to qualify for the big wins. See if you can follow the Major's orders in this exciting slots game. If you're successful, you could walk away with millions! The Major's Millions logo will acts as a wild. It will substitute for all other symbols to help you create more wins. If one appears in a winning combo, it will double your prize. If two appear in a winning combo, it will quadruple your prize.